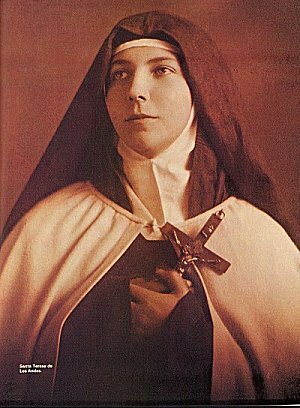 Entered into the Carmel of Los Andes on May 7, 1919, Teresa begins her postulancy, first step of her religious life. She enjoys in her heart a very deep joy for having given herself totally to God, renouncing what was dearest to her (her family) in order to follow Christ. From the beginning she strives to fulfill the Carmelite rule with perfection, great fidelity and love, offering herself for the humblest and most disagreeable works. She thinks that Carmelite life consists in three things: to love, to suffer and to pray for the conversion of sinners, the sanctification of priests and the Church. With the permission of her prioress, who understands that the new postulant is an exceptional soul, Teresa has an intense epistolary activity. Her letters radiate the love of Christ and the joy to fully belong to him. Touched by her witness, several of her friends shall enter religious life. On September 8, 1919, Teresa is accepted to the novitiate and the reception of the habit. She receives it on October 14, 1919, in the presence of her family and of many friends. All the witness are impressed by her radiating joy. Teresa receives in her monastery many graces of union to God, although she is not exempt from spiritual trials, especially temptations and spiritual dryness. She has a privileged relationship with her prioress, but the prioress' assistant for the novitiate makes her suffer a lot by constantly correcting her. In the first days of March, 1920, Teresa tells the confessor that she has only one month more to live on earth. She asks him for permission to do extraordinary penances. The confessor does not believe her (how could she know the time of her death?) and tells her to be satisfied with observing the Carmelite rule with perfection. Teresa is stricken by an illness which she knows shall lead her to death. Nonetheless she participates in all the spiritual exercises of Lent that year, including the rigorous fasting. On Good Friday, April 2, 1920, Teresa begins her way of the cross following Christ. She spends many hours in prayer in the choir. The sisters notice that she has a burning fever and tell her to go to bed. Several physicians examine her without managing to diminish the fever which devours her. Their diagnostic is an advanced typhus. On April 7, Teresa has the joy of pronouncing her religious vows in articulo mortis: according to the custom, a novice in danger of death can pronounce her vows (however, if she recovers, she must return to the novitiate). After great physical and spiritual sufferings, Teresa surrenders her soul to God and dies on April 12, 1920, at 7:15 pm. "For a Carmelite death has nothing ???. She is going to enter true life, to fall into the arms of the one who she has loved above everything on earth, to be eternally immersed in love." The burial is celebrated on April 14. The sisters and the family are surprised to see the convent's chapel flooded by people who, although they have not known Teresa, come to venerate the little saint who just died, as they say. Thus Teresa's fame of holiness is immediate and shall grow in the following years. The sisters receive very quickly many testimonies coming from people who received graces through Teresa's intercession. On November 23, 1920, the young sister of Teresa, Rebeca, enters the Carmel of Los Andes, convinced that God is calling her to substitute her sister in the community. She shall valiantly follow in the footsteps of Teresa until her holy death in 1942.